Depending on the numbers and sizes of bass you catch this month at Bogue Homa, more than likely you’ll bring trophy grass to the boat as well as trophy bass. 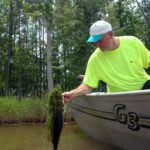 According to Paul Elias, Bogue Homa is home to lots of cypress trees, so be sure to fish around the cypress stumps that may have grass around them for bass like this one. My October pick is one of the best fall bassing lakes in Mississippi is shallow, 882-acre Lake Bogue Homa with its several feeder creeks near Laurel. October is when the baitfish start moving out of deeper water and into shallow grass, vegetation and lily pads, with the bass following. Bass realize they need to put on weight for the cold weather that’s coming. Very stumpy, Bogue Homa has a center channel running through it that you must move your boat away from to fish some of the shallow grass and stumps. I’ll start fishing in the back one-third of the lake, its northern end, and fish all the way around the back of the lake before turning and coming down its southern side. In September, the grass and lily pads begin dying off and breaking up. Most of the places you’ll fish you won’t have fished all summer because they were grassed-in. I’ll fish with four basic lures for October bass in the same places, including a Mann’s white Super Frog, a black Pygmy Frog, a shad-colored Baby 1-Minus and a black/blue Chatterbait. I’ll cast a white Super Frog on 50-pound bass braid with a 7.5:1 Shimano Curado K reel on a 7-foot, medium-heavy Shimano rod around lily pads and grass. I’ll target open areas behind matted grass and holes in the grass, listening for baitfish smacking under the grass and watching for them swimming on the surface. I’ll walk the Super Frog like a Zara Spook as a search bait to cover lots of water until I get a bite. Once a bass blows up on a Super Frog, I’ll slow down for 50 yards below and above the place of the blowup. Any time I see any activity in the grass or the pads, I’ll cast all four lures. If bass don’t want the Super Frog, I’ll throw the black Pygmy Frog with the same rod, reel and line I’ve used with the Super Frog. However, I’ll work the Pygmy Frog more slowly, pop it and let it sit and repeat several times. I’ll be fishing in those open pockets and holes in the grass and lily pads. With this two frog technique, I’ll present a relatively fast-moving frog and follow that with the smaller, slowly moving Pygmy Frog. I’ll fish this gray/blue-backed, pearl-sided and orange-bellied lure on 20-pound White Peacock fluorocarbon on a 6-foot-10 Shimano rod with 7.5:1 Curado K reel. I’ll cast into any open water in the grass or the pads, fishing it out in front. When fishing regions with broken grass, I’ll make short or long casts where I think I can retrieve the Baby 1-Minus about 10 yards before it hits and becomes hung up. This lure will run just under the surface in the same areas where you’ve fished the two kinds of frogs. 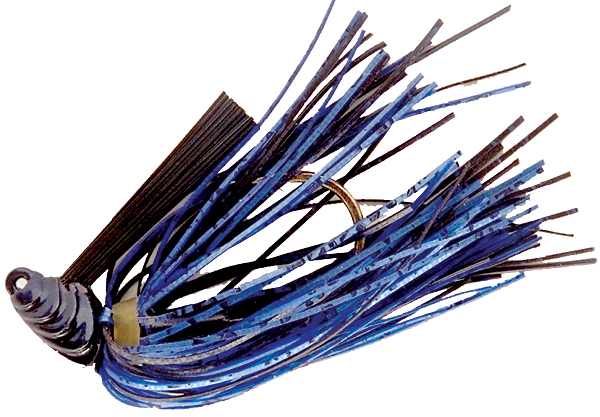 This lure produces many big bass, and I like a ¼-ounce black/blue chatterbait with a black/blue craw worm trailer. I’ll fish this lure on a 7-foot-2, medium-heavy Shimano rod with the Curado K reel on 30-pound bass braid line. I’ll tie on about 10 inches of fluorocarbon as a leader then tie on a Chatterbait. I’ll cast it into any open water in the grass and the pads and their outside edges. Toward the end of October, you’ll see bass blowing up on the surface, feeding on shad. The bass usually will start schooling on top, in front of the grass beds and lily pads. This lake also has cypress trees where I’ll steadily retrieve the Chatterbait in the open water between the trees, their trunks and the grass. 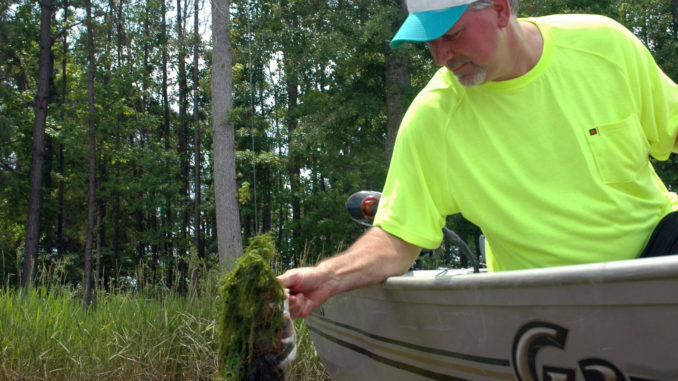 Your bait will get caught up in the grass, especially if you’re fishing over coontail moss. When you’re in a place that’s holding a good number of bass, you can catch some of the biggest bass on the lake with the Chatterbait around the grass. 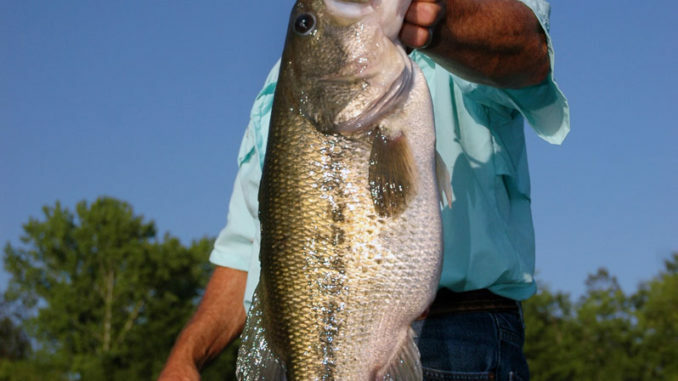 Many local tournaments are held at Bogue Homa from 5 to 9 p.m. To finish in the top 10, you’ll probably have to bring in five bass weighing a total of 20 pounds or more. Also bow season has started, and gun hunters are putting out their trail cameras, scouting for deer and cleaning up their hunting camps, taking pressure off the Bogue Homa bass. October through December are my favorite times to fish Bogue Homa. I’ll expect to catch from 10 to 20 bass each October day weighing between 2 and 9 pounds, and the lake holds numbers of 4- to 6-pound bass. 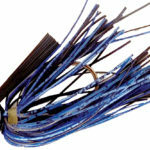 Buzzbaits and Reel N’Shads can be dynamite this month in the shallows. A Stone Jig is a great tool for catching Bogue Homa Lake bass that are in the cypress trees. 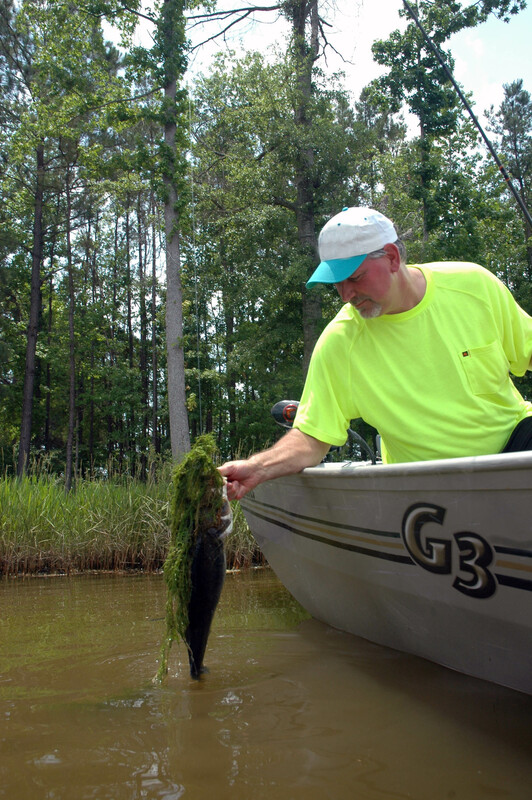 Bogue Homa Lake, an 882 acre lake six miles east of Laurel, is tough to fish in the summer. This relatively shallow lake has cypress stumps, cypress trees, stringy grass, lily pads and several channels running through it. 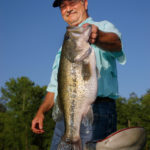 But two happenings at Bogue Homa in October make it prime fishing for big bass — when the lily pads start to die off, and if the lake is or isn’t pulled down to winter pool. 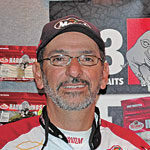 I start fishing with 1/8-ounce and ¼-ounce buzzbaits — one white and the other black. Although many anglers prefer a black buzzbait on a cloudy day and a white buzzbait on a bluebird day, I’ll cast both. I let the bass tell me which color they prefer on that day. I’ll fish around the lily pads and their edges, in the grass and on the edges of the grass through holes that open up this month. I’ll run the buzzbaits through the lily pads that are thinning out and dying off. I prefer to use a steady, medium retrieve for these shallow, active bass. Then the bass can follow and/or time their attacks easily. I like a 7.3:1 Pinnacle reel and a 701 medium-heavy Pinnacle graphite rod with the Balsax 20-pound-test Iguana monofilament line, since monofilament will float and give you better action on your buzzbaits. Due to the large number of underwater stumps at Bogue Homa, I wear my prescription sunglasses to see the stumps and the weed lines effectively. I also like to fish the 5 ¼-inch Mann’s Reel N’ Shad swimbait with a ¼-ounce weight. The pro blue color seems to be most effective, but if that color isn’t working for you, try other shad patterns. I’ll cast and fish the Reel N’ Shad in the same places I’ve fished the buzzbait around the dying lily pads, but about a foot under the water. Bass also will be schooling on the surface in October. 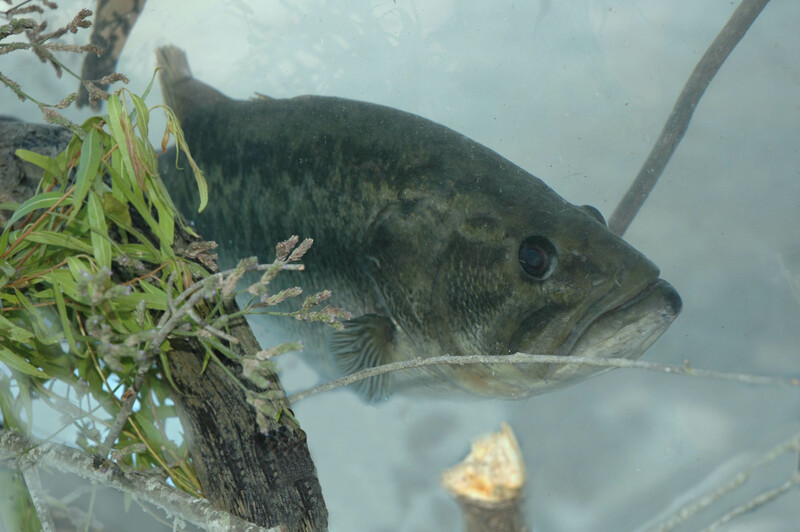 At most lakes, the bass on the surface are usually the smaller, more-aggressive bass; the bigger bass will be holding at the bottom of the school. However, because Bogue Homa is a relatively shallow lake, when the bass are schooling, you’ll have a mixture of small, medium and large bass in the same school. I’ll swim the Reel’N Shad fairly fast and shallow, with a steady retrieve. If the lake level has been lowered, often the Reel’N Shad is the most-productive lure, since you can see the underwater stumps better. 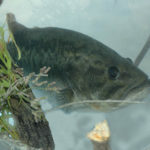 I’ll swim the Reel’N Shad over the top of and past each side of a stump if the water is down, depending on how aggressively the bass are biting. With the Reel’N Shad, I’ll fish the same equipment I did with buzzbaits, but switch to 20-pound White Peacock fluorocarbon line. 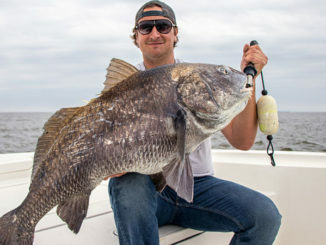 At Bogue Homa this month, you also can catch some good bass by fishing a Mann’s 3/8-ounce black-and-blue Stone Jig with a black-and-blue crawfish trailer on 25-pound test White Peacock fluorocarbon line with a 7-foot, 6-inch Pinnacle pitching rod. In October, bass will relate to the cypress trees and the cypress roots around the trees. There are numbers of small underwater creek channels that run into the lake. Instead of randomly fishing all the cypress trees in the lake, I’ll concentrate my jig fishing on the cypress trees closest to those creek channels and up to 30 yards away. Three very productive channels for bass on the north side of the lake wind through the cypress trees. Depend on your sunglasses, due to the abundance of underwater stumps your trolling motor may hit. 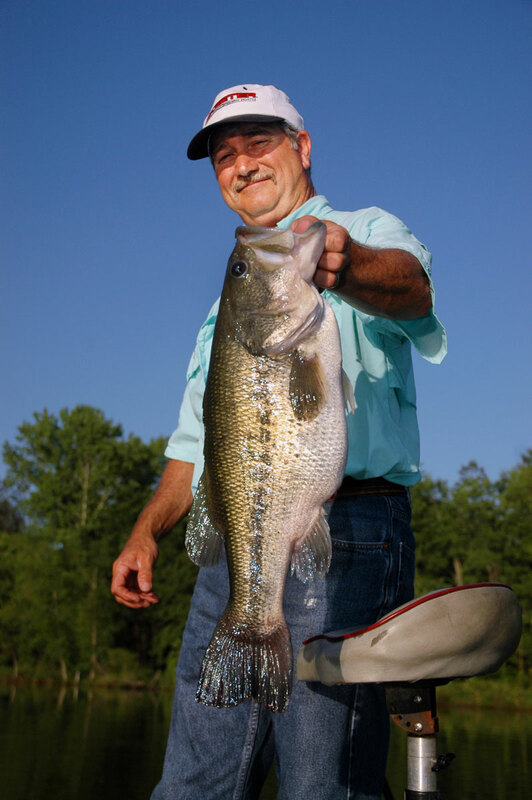 Don’t think you’ll catch a large number of bass at Bogue Homa during October — but remember that the lake is producing some 7- to 9-pound bass right now. If the water’s been lowered, I expect to catch 15 bass in a day, although those fish won’t be keepers because of the 15-inch size limit. If the water’s still high and the vegetation hasn’t died off, you might only catch seven to eight bass in a day, but they’ll be quality bass. Either way, if you can determine the right October pattern to fish, you can have an outstanding day of bass fishing at Bogue Homa.